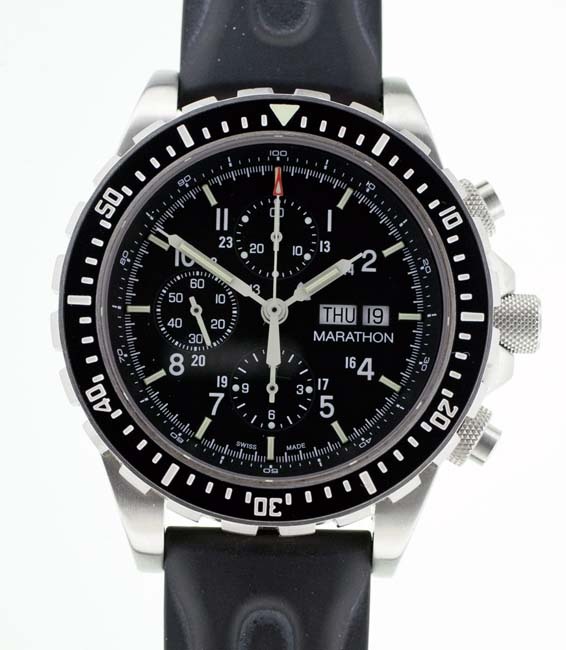 The Marathon CSAR Chronograph was originally spec’d as a pilots chronograph but due to minimum production requirements there have been production surplus models for sale. 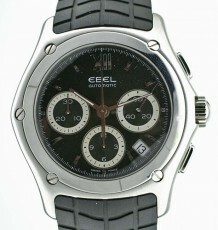 This particular watch is from the 2007 production. 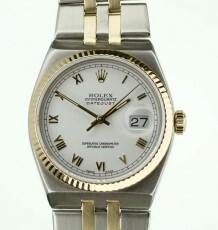 It has been back to the factory in Switzerland for a crown replacement approximately a year ago. At that time it was inspected and given a clean bill or health. It continues to function flawlessly. The watch is made in Switzerland under contract by the Canadian company, Marathon. 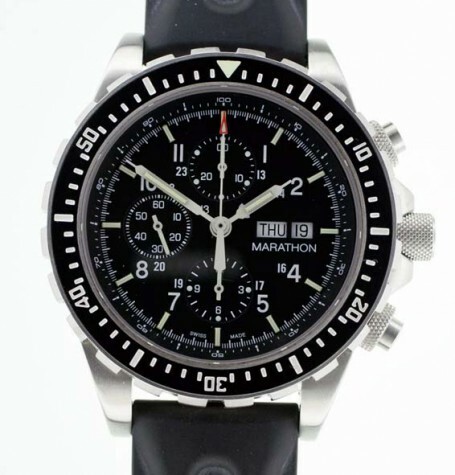 The Marathon CSAR Chronograph Automatic Military Pilot’s Watch, part number WW194014 carries the NATO stock number NSN 6645-01-544-0408 and is water resistant to 30 atmospheres of 300 metres or 1000 feet. Both pushers are threaded to screw down to resist water penetration when not being used. 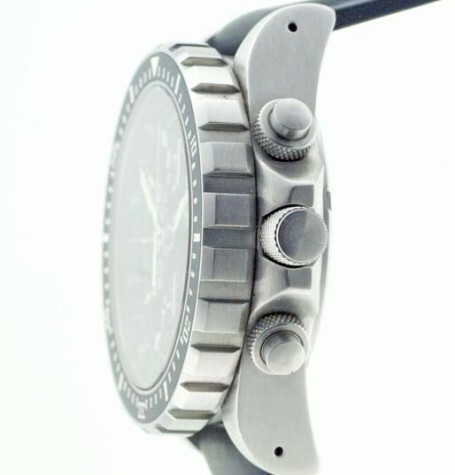 The large knurled steel crown is also a screw down model. Under the sapphire crystal, the matte black dial is marked with bright white stick markers and Arabic numbers at the hour markers. Each of the three chronograph register indexes and hands are painted with MaraGlo paint for better night viewing. 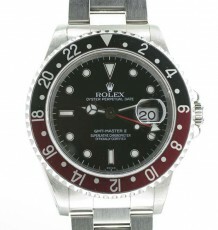 The hour markers and main hour and minute hands have tritium tubes attached or sustained legibility in dark conditions. 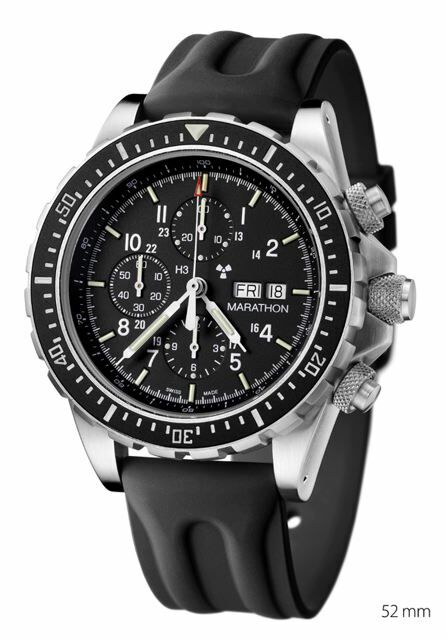 The pattern of chronograph registers stacked on the left side of the dial signal to many watch enthusiasts that this monster Marathon CSAR is powered by the legendary Valjoux 7750 automatic chronograph movement. 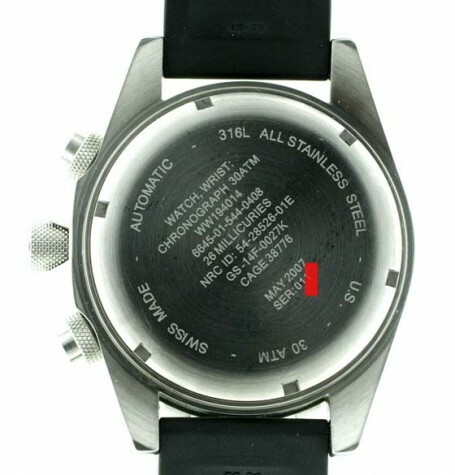 The dial also contains a dual day/date window at the 3 o’clock position. 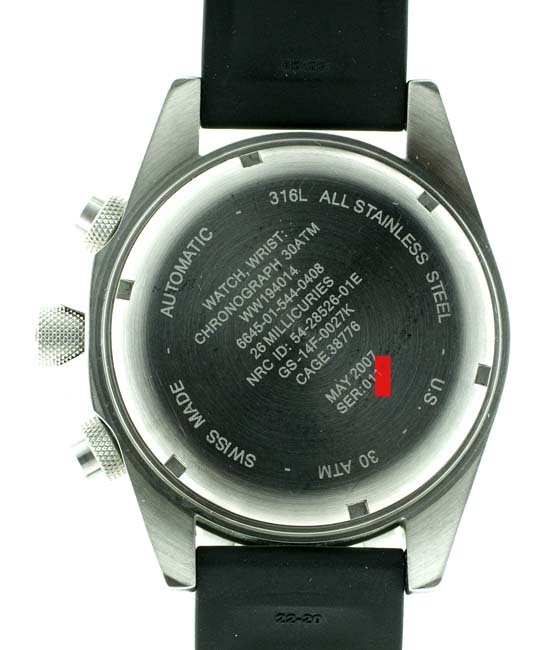 On the heavy steel case back the engraved markings include the NSN number, Tritium specifications,water resistance, date of production and serial numbers. 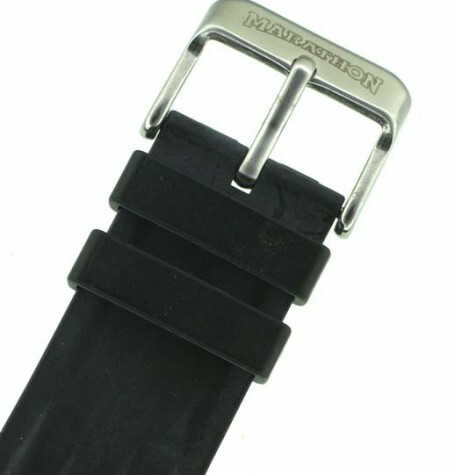 The steel case formed in 316L corrosion resistant stainless steel is 48 mm wife by 55 mm long. 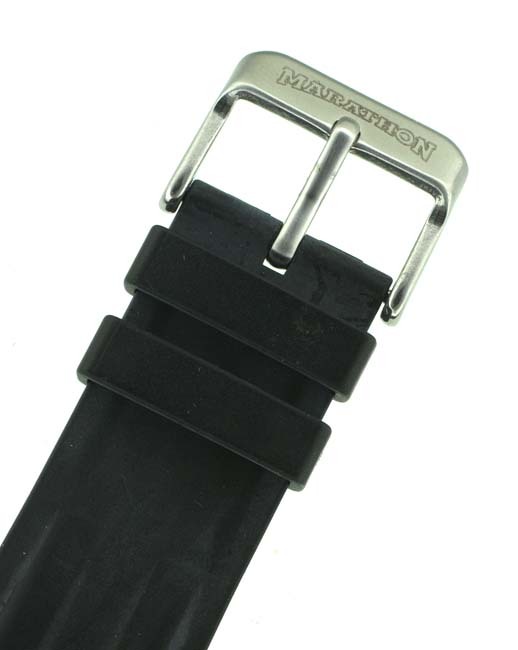 The watch is fitted with a 22 mm wide original Marathon rubber strap. 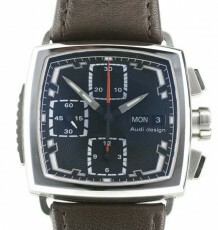 The watch also comes with the original inner leather box and outer Marathon CSAR box. 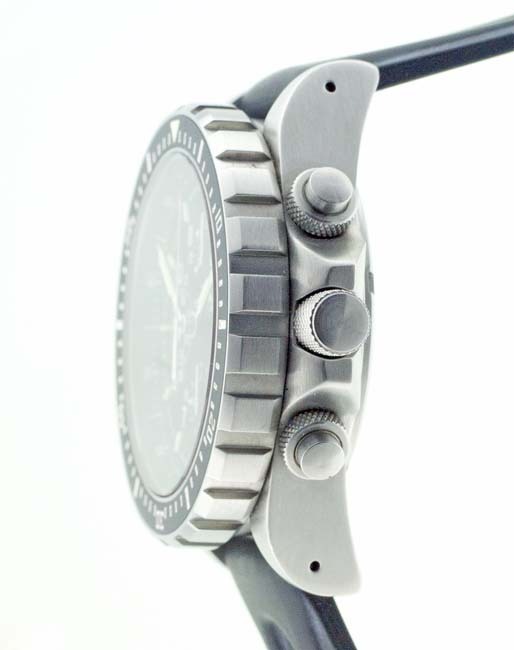 This watch is in excellent condition with practically no sign of wear.